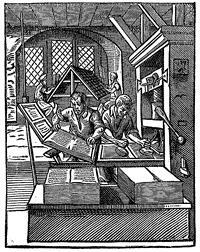 Printer, from Jost Amman and Hans Sachs, Das Ständebuch. Frankfurt am Main 1568. Ten titles from the Medieval Academy Books series are now available through amazon.com and its print-on-demand program. To find these books you can use the advanced search option, search by publisher “Medieval Academy of America” and sort the results by publication date. Additional titles will continue to appear until all of the 105 titles published by the MAA itself are available. They will appear in paperback format and be reasonably priced for scholarly and classroom use. As they become available online, we will also be hyperlinking these titles on our website at http://www.medievalacademy.org/books/book_mab.htm. The Medieval Academy Books series was initiated in 1928 — just three years after the founding of the MAA. The first publication was Lane Cooper’s Concordance to Boethius. The latest volume to be published is number 112, The Cartulary of Countess Blanche of Champagne, edited by Theodore Evergates.